ARRIVA - SW4 on route 329 seen at Turnpike Lane this morning 07.40ish.....showing 340 to Enfield, Arriva logo in the rear box....if it couldn't show the route number it is working it should not have been out IMO I hope it got fixed later and not stuck on 340 all day? (mind you saying that I assume these SW class have electric blinds and not manual? If manual would have just needed winding round a tad!). 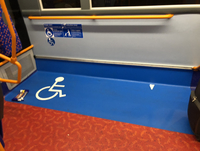 I was on a 261 earlier and noticed how large the wheelchair space is on these new spec MMCs and have to say it is about time. TLs and RATPs MMC on the H12 & H14 are the same I’ve noticed, could fit about 4 or 5 buggies in this space or 1 Wheelchair and 2 buggies sharing the space. Brilliant spec. I noticed this too when I went on the 193 and 165 too back in December. Its a shame the MMCs for KB for 181 & 284 didn’t get this spec. The worst Wheelchair space design has to be the Gemmini 2s, horrid design. In addition this is so late too because Omnicitys have had large Wheelchair spaces since they were introduced. There was a 25 abandoned on Havelock Street this afternoon, not sure why on earth it was there but all it was doing was causing confusion among car drivers coming out of the Exchange mall. It's not as if the bus stand wasn't around the corner or even the Ilford Broadway stand could have been used if the driver wanted to kill time without wasting space at Hainault Street. A 169 was regulating on Ilford Lane as well, what a terrible place to regulate. The road is already narrow as it is to a point every time a bus stops traffic builds up and it's not particularly easy to overtake buses either. The 25 drivers (or sometimes the 425 drivers these days) do quite often like to make up their own stand anywhere around Ilford like Havelock Street as you mentioned and also at bus stop used by other routes such as Westbound Hainault Street stop that are used by Cranbrook Road routes, both sets of Eastbound Hainault Street stops and the Eastbound Redbridge Central Library stop that is mainly used likes of 86, 128 & 150 towards Goodmayes. Just seen 2 consecutive 94s, one curtailed to Goldhawk Road Station and the other Shepherd's Bush. I guess the first rally/demo of the year in central London is the cause?